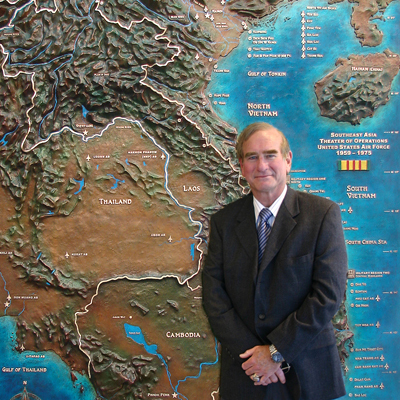 A successful monument must do more than just take up space. It must be exciting and motivational so that donors will want to participate and visitors will want to make it a must see destination. Boring monuments don't get built or visited. 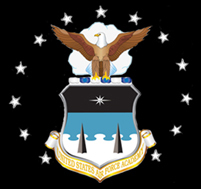 Successful monuments, which honor specific events, such as the flag raising at Iwo Jima, are successful because the event illustrates those higher values and how we as a society and individuals rose to a great challenge. 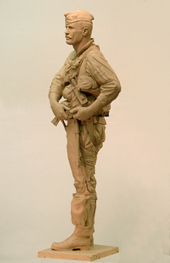 The most powerful memorials in America which on the surface seem to honor an individual, are successful not because of the individual, but because the memorial honors a higher universal concept which that person embodies. The Jefferson memorial honors the founding of our country, the Lincoln memorial remembers the American Civil war, the Martin Luther King memorial honors the American Civil Rights movement, and Mount Rushmore honors the power and majesty of America. 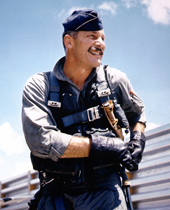 The selection of Robin Olds as a sculptural symbolic poroxy will significantly contribute to the credibility of the Air Warrior Combat Memorial, firmly establish the warrior context, and will more effectively allow the memorial to honor all warrior graduates of the USAF Academy . On his broad shoulders we all proudly stand. 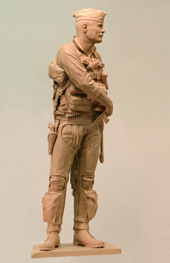 The warrior sculpture photos depict a 40 inch tall clay maquette which was sculpted during 2012. 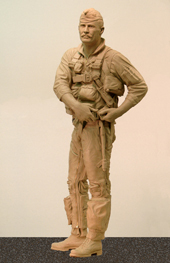 Once the project has been funded, the maquette will be enlarged in clay to 6 ft 6 inches, re sculpted, and cast in bronze at Bronze Services Foundry in Loveland Colorado. . 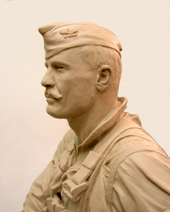 The sculpture was created with a live model, and by reference to numerous photographs of Robin Olds. Jim considers this a portrait sculpture and attempted to capture not only his face but body structure and body language. 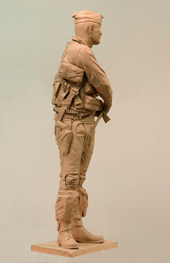 For accuracy in sculpting, a complete set of Vietnam era flight gear was obtained through ebay and worn by the model. 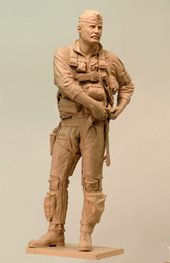 Robin Olds' daughter Christina will provide critical family input and assistance in refining the monumental portrait. 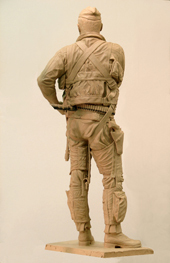 Standing, twisted to his left in the act of buckling his chute leg strap, the last act before taking off. Ready to engage. Implied motion and energy. Facial expression will be determined with concentration. This will improve in the monumental figure. 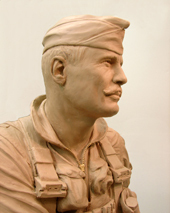 Mustache is a critical artistic and historical element designed to connect the sculpture and memorial to the “Old Timers” the swashbuckling airmen of WW1 and WW2, of which he was one. Hands are in a gesture as if drawing a sword which adds to the warrior theme. 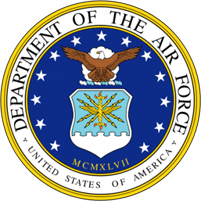 A Complete design presentation of the Air Warrior Combat Memorial is located at this menu selection "Memorial Design"
Click this link to the " Robin Olds Page"